Dr. Paul Buscemi was the VP of Research and Development at Restore Medical Inc. in Medina MN, now a part of Medtronic. Paul and his team were responsible for conceptualization and realization of a new tongue implant to treat sleep apnea. Restore Medical’s challenge was to build a simple, innovative, minimally invasive, palatal implant. The R&D group needed to get insights beyond airway closure to study the effect of the implant on critical tongue functions such as speech and swallowing. Using MSC.Software’s CAE products Paul and his team were able to perform a complete analysis of a new human tongue implant design. 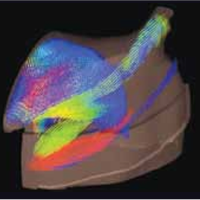 Using MSC.Software technology, Paul’s R&D team created an accurate model of tongue musculature and motion. The model was used to design and test a virtual prototype for a new tongue implant and its effects.